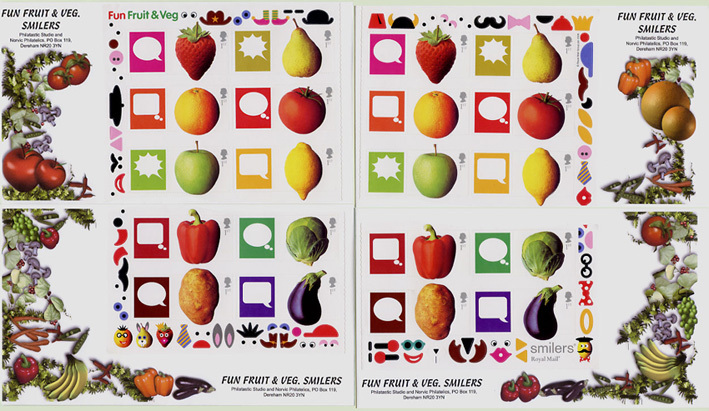 Royal Mail have announced the issue of a Smilers Sheet consisting of 20 x 1st class stamps, being 2 sets of the 10 customisable "Fun Fruit 'n' Veg" stamps originally issued in 2003. The original stamps can be seen here. 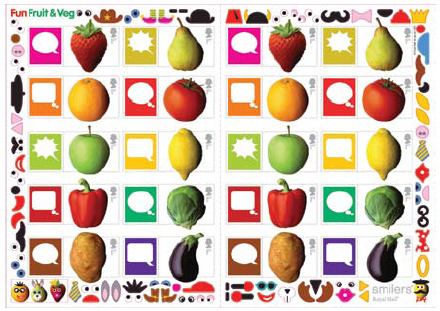 Hats, eyes, noses, etc are printed in the sheet border; these may be peeled off and to make characters on the stamps, in the style of Mr Potato Head. Designed by Johnson Banks, the sheet will be printed in litho by De La Rue Security Print, so this produces new stamps as the originals were printed by Walsall SP in gravure. All images are Copyright 2005/6 by Royal Mail. Postmarks for use on the day of issue. This is not regarded by Royal Mail as a new issue, so no official First Day postmarks are provided. The following postmarks - and all permanent postmarks can be used. We have an exclusive set of covers for this sheet produced in conjunction with Philatastic Studio in Austin, Texas, priced at £17.95 for the set of 4. We also have an different cover for single stamps, and (in pairs) sets of 10 stamps removed from the sheet. 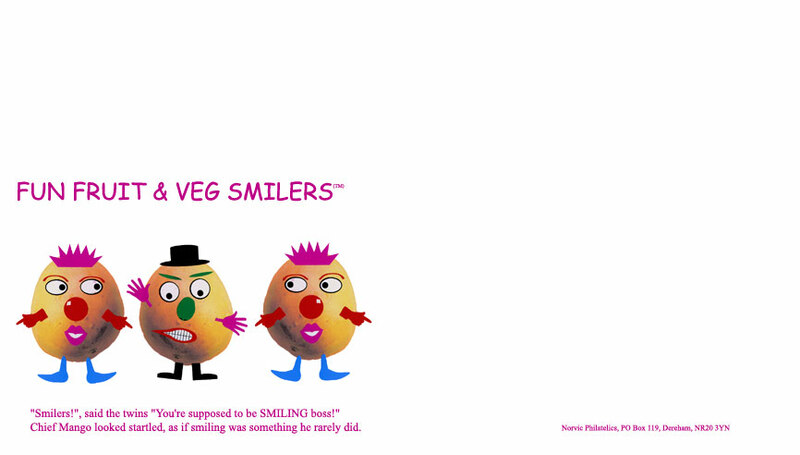 "Smilers! ", said the twins "You're supposed to be SMILING boss!" Chief Mango looked startled, as if smiling was something he rarely did. There will be no Royal Mail FDCs for these stamps. If you would like to be told when this page is updated, please email us.